“I like the classic style. 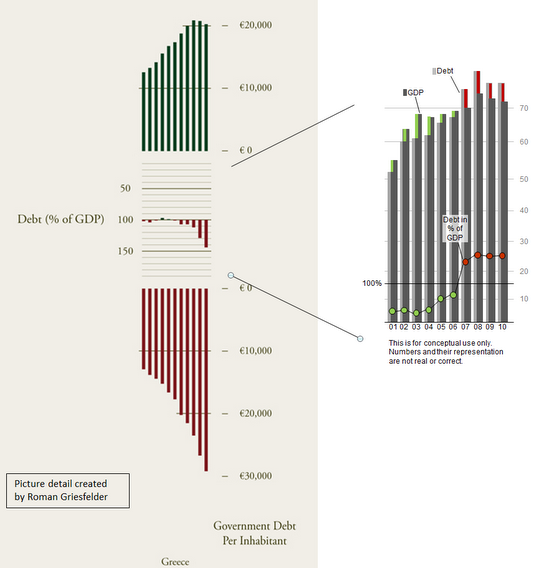 Still I have a hard time understanding the middle part (Debt % of GDP). Why are there positive and negative numbers for the %? Is it possible to have a negative percentage of debt? Certainly not. Can't be true! What I perceived as zero (the point where green becomes red), is not zero. It is 100%. That means, that numbers greater than 100 go up and numbers lower than 100 go down. But no, it is the other way round! 50 is above 100 is above 150. It means, that numbers smaller than 100 make the columns go up when they decrease. This is hard to understand. For the eye countries like Luxembourg or Estonia (on the far right) have the highest % of debt. But actually they have the smallest. Thank you for your thoughts on this, I gave this aspect a great amount of consideration when I designed this visualisation and I selected a method which I feel presents the data in the clearest and most logical manner to someone without any previous knowledge of this issue. I hope I can clarify a little more. The intention of this piece is to highlight the relationship between two factors that have positive and negative effects on each countries economy. The positive effect (GDP) is shown using bars progressing upwards. The negative effect (debt) is shown by bars moving downwards. The colours green and red were also selected because of the connotations they share with growth and contraction. Between the two we see how these factors balance out by showing the amount of debt expressed as a percentage of GDP. If the amount of debt is equal to it’s GPD, debt will be show as 100% of GDP. We can consider this to be the baseline with the economies performing well represented above it, and those in trouble below. Greece has levels of debt almost one and a half times it’s GDP, shown on the chart as nearly 150%. This is not a good situation for Greece! It was really important for me to show this negative situation using the same idea expressed before, that is red bars moving downwards and below the baseline. 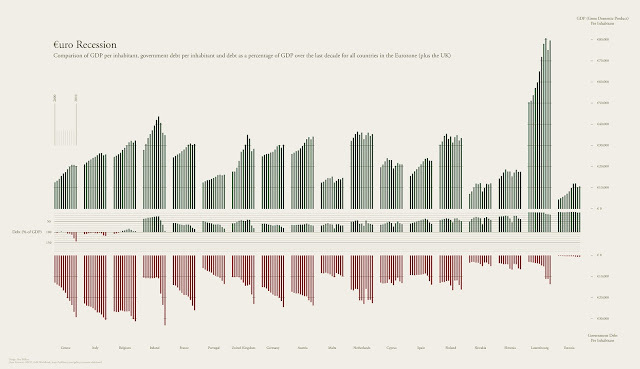 Countries such as Luxembourg and Estonia who (for very different reasons) have very low levels of debt when expressed as a percentage of GDP, are shown using the green bars growing upwards above the baseline. As you point out it would normally be expected that a y-axis is labeled with the smallest figures at the bottom, however if this was the case in this example the poorly performing countries would feature bars progressing upwards, which is a contradictory impression to the one which I felt was appropriate. Of course this issue would have been avoided had I chosen to instead show GDP as a percentage of debt, however this would have had a dramatic effect of the scale required since the figures then range between 70% and 2,701%. In a test this produced a highly unbalanced appearance which I believe would not have been a good choice for the purpose of comparison between countries in this case. When designing any piece of visual communication it is of course vital to consider the general rules and conventions which readers will approach you work with. However as you may be able to tell from my work I enjoy challenging these conventions if I feel there is a more interesting or logical alternative, or if it offers a fresh view of the data that can lead to new levels of understanding. Many thanks for your thoughts on this and allowing me to share some of my approaches to design. Hi Roman. Its great to see an alternative way of showing this data. I still prefer my version if I'm honest, however I understand your concerns and appreciate that different methods of visualisation work for different audiences. I have found this discussion tremendously useful and hope that both our practices will benefit as a result. Both points very well made. An interesting debate!